I have a map of vegetation in 1913 for a particular landscape (approx 35,000ha), of which I have data for just short of 60% of the landscape. The limited visibility is due to the coverage being derived from oblique photos, and large areas are obscured by ridges etc.I need to develop a prediction for what is in the invisible areas. 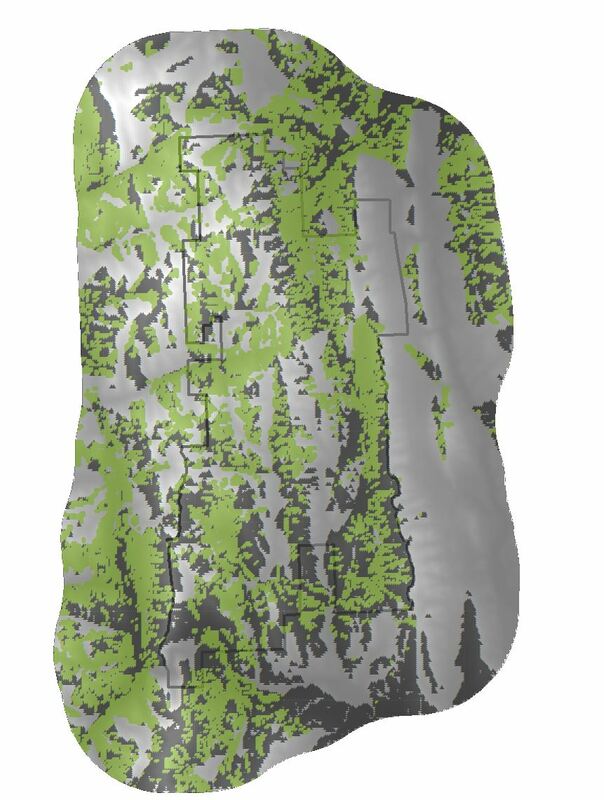 The attached map shows the landscape as Forest (green) , Non-Forest (dark grey) and the missing areas are paler grey (a DEM coverage). I have settled on using Indicator Kriging (using ArcGIS 10.3 Geostatistical Wizard) to fill in the missing areas. I have developed a model that predicts forest correctly in 83% of the landscape, and is 86% accurate for non forest (ie. if the real cover is forest, 83% of the time the kriging prediction says it is forest, and 17% of the time it says it is Non Forest). In my model I have turned Anisotropy to "true", because there is a trend towards more non forest in the SSE corner, and more Forest in the NNW corner. However, I suspect that elevation and insolation are also factors in controlling vegetation. How can I include Elevation and Insolation (I have the rasters for these) as predictors to see if they improve the model? Having done this type of modeling for decades, I can say that, in how your problem is defined, Kriging is a very poor choice and, without understanding nonstationarity, you are probably violating the hell out of some important assumptions. You are likely getting your stated accuracy due to overfit and not actual prediction accuracy. If you were modeling something like spread of noninvasive species (that follows a spatial die-off) you may be able to justify a model such as Kriging but not here. I would dissuade you from exploring MaxEnt because of some intractable statistical reasons see: Renner & Warton (2013); Yackulic et al., (2013); Royle et al, (2012). As the saying goes "what is your question"? I would think that you may have a model specification issue on hand. This is where the incorrect covariates are being defined, or an incorrect hypothesis, in describing the variation in your process. My reasoning is that you are getting poor model performance in multiclass Maximum Likelihood and RF model(s) which may indicate that you do not have variables that represent variation in these classes or have very poor training data. It also sounds like you are using covariates (elevation, insolation, ...) that are indicating "potential" rather than observed (BTW, I am consistently getting after my students that elevation is not a defensible process!). By representing forest as a binomial process the variation is being reduced and the covaritaes more representative of the modeled process. I would point out that nominal variabies (eg., Natural Subregions?) can artificially partition continuous variation to the point that it is meaningless. Potential would effectively be modeling niche, using variables that indicate environmental variation, that the vegetation could "potentially" occupy where, modeling observed would use something like active or passive remote sensing to model where the process is actually observed in the field/data. The nature of "potential" occupancy adds a layer of uncertainty that needs to be accounted for in evaluating model performance. If you settle on modeling the potential occupied niche, then you should carefully select variables that indicate ecological process of each desired class (eg., a variable important for trees may not matter for grass). It is also plausible that your classes interact in a way that changes to probability of occurrence. An example of this would be gaps in canopy influencing occurrence of grass and forest composition influencing other understory species. Modeling is not, and should not, be a one-size-fits-all push button endeavor. At this juncture, I highly would recommend talking with a statistician or one experienced in vegetation modeling to get some guidance. Kriging seems like a poor choice here. First, what is the role of spatial autocorrelation in predicting whether an area is forested or not? Since, at its core, kriging is a method that predicts based on distance, you should only use it if you have a good reason to believe distance plays a large role in why there is forest at a given location, or if you have no other predictors available. It seems here that distance would be a distal predictor, or proxy variable, which is why you needed to include anisotrophy in your model - because really you need to be modeling the effect of elevation or whatever it is that changes as you move in that direction. Second, you give an ~84% accuracy rate. How was that determined, and for how much of your study site? Is it only for the ~60% of the area you have coverage for? If I were you I would use a different method altogether to predict forest occurrence, especially since you have so many other, and better predictors than distance. A method like Maxent has not only proven to be as accurate at predicting species/vegetation community occurrence as almost all other methods, but it's also very user friendly. You shouldn't use it uncritically, but you also don't need to be a statistician to get accurate, reliable, and defensible results. Not the answer you're looking for? Browse other questions tagged arcgis-desktop arcgis-10.3 kriging geostatistical-analyst or ask your own question.